LaMoure County 9-1-1 calls are answered by North Dakota State Radio in Bismarck. For non-emergency calls, please contact State Radio at 1-800-472-2121. To obtain a new 9-1-1 address or verify an existing address in rural LaMoure County, please call 883-6096. For a new address within a city, please contact your city administrator first and then LaMoure County 9-1-1 Coordinator. 9-1-1 can help you. In an emergency, seconds matter, so being knowledgeable and prepared can make all the difference. Know WHEN to call 9-1-1. 9-1-1 is for emergencies only. You should only be dialing 9-1-1 if someone is hurt or in danger, or if you are in immediate need of police, fire, or medical assistance. If you aren’t sure if your situation is an emergency, you should err on the side of safety and call 9-1-1. If it isn't safe to talk, you can also now Text to 911. Know WHERE you are. This is probably the most important information you can provide as a 9-1-1 caller, so try to be aware of your surroundings. Never hang up. You may have called 9-1-1 by accident, or your situation may have resolved itself, but it is important to let the 9-1-1 dispatcher know this. Don’t let your kids play with old cell phones. Many people don’t know this, but the law mandates that even old, deactivated cell phones with no associated service plan must still be able to call 9-1-1. Don’t have a landline phone? If you choose to do this, remember your address is not visible to the dispatcher. Don’t leave young children home alone without some means of communication. 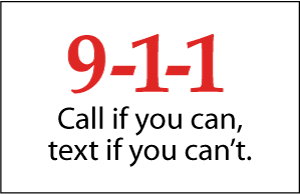 Text to 9-1-1 should only be used in an emergency situation, when placing a call is not possible, for example: if the person needing emergency help is deaf, hard of he aring, or when speaking out loud would put the individual in danger. Enter “911” in the To Text to 9-1-1: Type 911 in the “To field”. It is essential for users to include in the message their location including house number, street address and city. Send Police. 123 Best Avenue. Jamestown. Intruder in home. Send Ambulance. 555 88th Street. 2 vehicle crash. LaMoure County is a member of the North Dakota 911 Association.